Lights! Camera! Fabulous! You won't have to memorize any lines to pull off this act. Just try this top to add a little drama to your jeans. 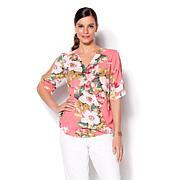 Lovely draped details keep all your fans captivated by your every move. No acting classes necessary. Awesome top! No pin required. The top is awesome! Just throw it over your head and you're good to go. My only issue is l bought 2 at regular price and the very next week you put them on sale. So I had to buy 2 more. Even though there is allot of material up top i still love the top. I have 4 in different colors. I believe you do not really bring back items but I wish you would again, at least for the holidays bring this one back. This is a return request from a previous sold out presentation. I was looking briefly and then it was all sold. The style is just a winner and very comfortable. I appreciate that Man cares to bring these styles in at an affordable level for anyone. this top is my first purchase from Iman and will not be the last. I love this top, very flattering and fits very well. I will be ordering more of these tops. Styles right with everything! Bought one in every color but one and only because it had run out. Transform separates you've worn a dozen times into chic ensembles that are fresh and exotic. This colorful duster layers over anything — a tank top and pants, a simple sheath dress, a maillot swimsuit — for resort-ready, photo-worthy looks. Wear it open and flowing or buttoned at the waist.